and depending on your pepper variety, they turn from green to red, purple, orange, or yellow. Maturity 70 to 90 days depending on variety. If planting from seeds see maturity dates on package. Seeds Depending on your choice of vegetable gardening, you can grow pepper plants from seeds or starter plants. Starter plants can be purchased at you local nursery, Lowe's Garden Center, or Home Depot. The drawback using this option is the lack of variety of pepper plants as well as their general health. You also have to be particularly careful not to purchase a diseased plant or one harbouring pests. However, if you feel your are certain as to the quality, health and choice of the pepper plant you want to purchase and it pasts the bug free test, then growing peppers from starter plants will give your plants a head start early in the garden season. Growing peppers from seeds does take a little longer and a little more patience, but you have control as to the variety of pepper you wish to plant and you know you're not introducing any garden pests or disease from your seeds to other vegetable plants you may also intend to grow. Over my years of gardening, I have tried both options of growing peppers as well as other vegetable plants and I advise beginner gardeners to get your garden off to a good start by opting to plant seeds. If you're not sure what is the best seed to purchase, I recommend Burpee Seeds, a company that has in my opinion only the highest quality and selection of seeds that will ensure a successful vegetable garden. However, if you have your own preferred seed manufacture, by all means purchase from them. The important thing is to purchase a high quality seed. Not just any seed packet that more often than not will not make it through your gardening season. Pepper plants are a warm season plant and like all other warm season plants you should wait until daytime temperature reach 65 F - 18 C., and night time temperature is at least 55F - 13C. 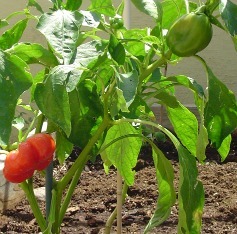 Pepper plants need 6 to 8 hours of sunlight each day to blossom and set fruit. Because these plants have shallow roots and somewhat brittle branches they must also be protected from any area of your garden that has high wind. Unfortunately, one year my neighbor didn't heed this advice only to find most of his pepper plants stems snapped from a strong wind that came up late at night when everyone was sleeping. Like most climbing vegetables, growing peppers in containers is an ideal solution for vegetable gardeners who are not blessed with a large vegetable garden area. Peppers adapt well to container gardening, but make sure there are holes in the bottom of the container for water drainage. Use a support system to support the vertical growth of the pepper plant. If you're not sure about how to go about this, read our article on vertical gardening. Peppers are light feeders and do quite well with an equal rating of 10-10-10 fertilizer. Although some of my vegetable gardener friends prefer a 5-10-10 fertilizer rating. If you like to know more about what these ratings mean, read our article vegetable fertilizer. If your pepper plant is not vigorous or your plants are light or pale green, apply a tablespoon of nitrate fertilizer around each plant after several blossoms have set. But be careful, do not apply if your plants are vigorous and show excessive growth. While I am on this subject, please take note a fertilizer with too much nitrogen will cause your pepper plant to grow tall with lush foliage but few blossoms. So do keep in mind not to purchase fertilizer with a higher nitrogen rating than other manufacture ratings on the package. to rot. To avoid this problem, plant your peppers in well drained soil and add some organic matter prior to planting to retain moisture. I also suggest using mulch to prevent excessive evaporation during extra hot summer days. A good soil moisture meter will help you maintain the right moisture your vegetable plants need and should be part of your garden tools. Like most vegetable plants, peppers are subject to a host of pesky critters including but not limited to flea beetles, aphids, leaf miner, and cutworms. You can learn more about these unwelcome visitors to your vegetable garden by reading our article garden pests.